Stirling Castle is possibly an 11th century courtyard fortress, founded by Malcolm Canmore. Standing on a volcanic outcrop, its first reference is in 1107-15 when King Alexander I endows a chapel. During the Wars of Independence the castle frequently changed hands, the English garrison surrenders in 1297 after the battle of Stirling Bridge and again in 1314 after the battle of Bannockburn. King Robert the Bruce then destroyed the castle, rebuilt and under English control in 1336, Robert the Steward starved the garrison into surrender in 1342. In the 1500s King James IV adds the impressive Great Hall and the imposing forework, in the mid 16th century the Renaissance Palace of King James V is built. In 1594 the Chapel Royal of King James VI was the last royal building and the North Gate of 1381, is now the oldest surviving building. In the late 18th century the castle was an army barracks and then a military depot until 1964. 8 miles north-west is Doune Castle. 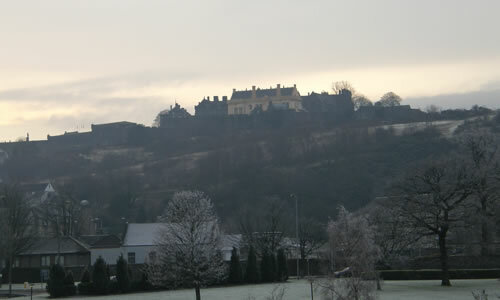 Stirling Castle is located above the town centre, off the Esplanade. 39 miles north-west of Edinburgh, on the A8-M9. The site owned by Historic Scotland and is open daily, April to September 9:30-6:00pm, October to March 9:30-5:00pm. There is a car park.